Posted on Sat, Dec 10, 2011 : 6:05 a.m.
Denard Robinson wore a heavy wrap on his right arm during the Minnesota game to protect a staph infection. While the world criticized Denard Robinson for his declining accuracy and growing inconsistency, he had a secret. The Michigan football team's star quarterback was suffering from a staph infection on his right arm -- his throwing arm. It was serious, too. Serious enough, he landed in the hospital for a night. He nearly missed a game. "I was close," Robinson said. "But, there was no doubt in my mind. I knew I had to play for my team. "I told (the doctors) I was going to play, regardless." Although he wouldn't say which game that was, it's believed to be the Big Ten opener against Minnesota, when Robinson sported a bulky bandage on his right arm. He called the injury a "boo-boo" at the time. Turns out, it was a lot worse than that. "It affected me a lot in games and practices," said Robinson, adding he's not sure how he contracted the infection, but doctors think it was colliding with the field turf. "But, I kept pushing it because I knew my teammates would do the same for me. I had to be accountable." Part of being accountable, Robinson said, was doing his job without making excuses. That's why he didn't tell the public — the secrecy was his choice, not the coaching staff's — and that's understandable. The unusual part, though, is he didn't even tell his teammates. Junior safety Jordan Kovacs didn't know about the staph infection until the media told him about it Friday. Senior defensive lineman Mike Martin knew about the infection, but not the hospital stay. Even receiver Junior Hemingway, who works closely with Robinson every day, didn't know about the injury, although he knew something was bothering his quarterback because of his performance. Finally, he asked Robinson what was up. "'C'mon, I already know," Hemingway replied. "Just go ahead and tell me." It's remarkable so few people knew about the extent of the star quarterback's injury. But, that's the way he wanted it, even though he was taking heat from critics for his performance -- especially his accuracy, which hovered below 50 percent for several weeks. Robinson wouldn't acknowledge whether the injury affected his accuracy, but he did say there was some pain while throwing for two or three weeks. Some critics were calling for backup Devin Gardner to replace him. Still, he remained mum. "I'm out there playing, so there's no excuses," said Robinson, who guided his team to a 58-0 win against Minnesota despite the injury. "I feel like if you go out there and play, there shouldn't be an excuse for why you lost, or for why you're this way or why you're that way. "I'm close to all my family, and everybody on this team is my family, and everybody on this staff is my family, and (them and) everyone back home told me just to keep my head up," Robinson said. "They knew what was going on, and everybody on the inside here knew what was going on. So, we didn't worry about what outsiders said." Robinson addressed the media on Friday for the first time since Michigan earned a bid to play in the Sugar Bowl. It will face No. 11 Virginia Tech (11-2) in New Orleans on Jan. 3. The junior was unusually talkative, and as relaxed as he's been in weeks. He wasn't even wearing shoes. He talked at length about the injury, and the unusual circumstances surrounding it, after covering it up for much of the season. Coach Brady Hoke said earlier Friday that in addition to elbow and hand problems that already were public, Robinson also had a previously undisclosed abdominal injury. The staph infection, though, was the most serious of them all. "There was some concern," Hoke said. "They are serious. You want to make sure you are doing everything the right way to help him through it. We have a great medical staff here and they did a tremendous job." Hoke said he didn't have to quarantine Robinson from teammates, but the football support staff had to thoroughly launder his gear. Robinson said the infection bothered him for two or three weeks, and there was a concern at one point whether he'd even be able to take snaps in practice. "There were times I couldn't take some, but I was OK," Robinson said. "(Center David) Molk eased the snap into my hands. I mean, he's one of the best centers in the country." Mon, Dec 12, 2011 : 12:14 p.m.
Sun, Dec 11, 2011 : 11:13 p.m. So THIS is what it means to be a Michigan Man? Frankly, I'm appalled. In this age of MRSA, playing with an open staph infection is irresponsible. If DR wants to gamble with his own health, that's one thing. Risking other's health is another matter. I keep hearing from you folks about how &quot;Michigan Men&quot; are special, better, and a cut above. To me it looks like just another case of &quot;me-first-itis' for DR and win at all cost for UM. A staph infection is a threat to his teammates in the locker room, the trainers who tape him and the opponents on the field. Like it or not, FB is a BLOODY full-contact sport. Bandage tears and exposure to another person's blood cannot be avoided during a game. You crucified Tressel for covering up to the NCAA when players improperly selling their own possessions. Yet the behavior of DR, the Blue trainers/med-staff and Hoke are displayed as a matter of pride. Just another case of Blue elitism. Mon, Dec 12, 2011 : 3:05 p.m. The osu...you have got many MORE severe problems to confront in Columbus. Tend to those first. Sun, Dec 11, 2011 : 11:53 p.m.
LOL. Wow! That was a clever spin. Credit for effort. Sun, Dec 11, 2011 : 12:51 p.m.
can we work this off the 'front page' already...? Sat, Dec 10, 2011 : 11:46 p.m. 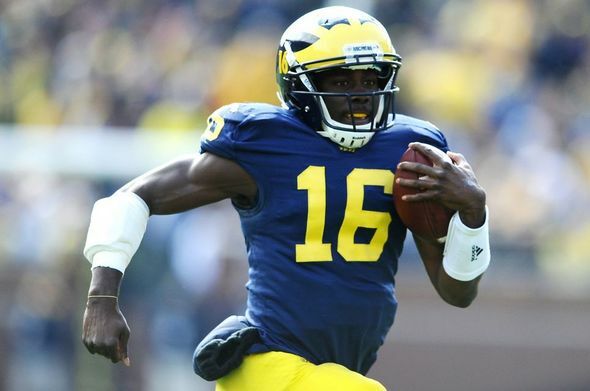 Sat, Dec 10, 2011 : 8:42 p.m.
As a Mich. Wolverine fan I am very proud of Denard. My neighbors out here in the desert watch Mich. football not because they are from Mich. but because they find the Wolverines very entertaining and they enjoy the play of Denard. I think, like Charles Woodson Denard will go down in history as a great addition to the Wolverine sports family. In my time players like Cassie Russel and the late great Rob Lytle come to mind for their unique toughness. For the rest of my life I will have good memories of Denard Robinson. Sat, Dec 10, 2011 : 7:58 p.m. Sat, Dec 10, 2011 : 5:11 p.m.
What does this guy have to do to prove to you folk who want him to convert to another position that he is a QB? His teammates seem to accept this, his coaches seem to accept this. Why can you Monday moaning QBs accept it. Kyle. I like your observation that during the interview he was actually wearing shoes. Sat, Dec 10, 2011 : 6:47 p.m.
Denard can play quarterback at the next level. All the great quarterbacks are getting in their final years and it is time for the next generation of quarterbacks to take over. Denard hopefully will stay for his senior year to hone his craft even more. This story is about true leadership and heart! Denard should be a finalist for the Heisman, but it is his next year! I think his teammates will make sure he gets it. Sat, Dec 10, 2011 : 3:05 p.m. I'm looking forward to seeing Denard return punts in the NFL. Sat, Dec 10, 2011 : 12:06 p.m. Anyone who doesn't love this kid hasn't got a heart. Sat, Dec 10, 2011 : 11:25 a.m.
Sun, Dec 11, 2011 : 1:03 a.m. Sat, Dec 10, 2011 : 3:33 p.m. Absolutely yes on the Rich Rod recruiting many of these great athletes. I can think on of other thing; Rich Rod and his staff did put in all of the long hours each day and each week, all year but, unfortunately, the results were not good most of the time. Sat, Dec 10, 2011 : 5:54 a.m.
What a great kid! You just don't usually see that level of selflessness out of someone his age at the qb position and with his athletic gifts. He is humble beyond his years. I look very forward to more performances like the last two games. And if we see those consistently, the sky is the limit for this team. However, if we don't see them every week, I won't be so quick to judge as I was early this season. Sat, Dec 10, 2011 : 5:27 a.m. I've loved this guy from day one, and I ain't stoping now, especially after reading that. I'm a huge Tom Brady fan because he was under appreciated at Michigan, and I'm going to be following D Rob wherever he goes, praying he has huge success! I don't see him as a qb at the next level, but he will be the next devin hester...and then some! He is a true Michigan Man! Sun, Dec 11, 2011 : 1:01 a.m.
Tom Brady was a good quarterback, but he became great by continuing to learn and develop and improve well into his NFL career. He was a 6th round draft choice, becoming the 199th overall draft choice in his senior year. I liked him (and still do) a lot, but it wasn't just at Michigan where he was under appreciated, if that was what it was. Denard is the same kind of man. He keeps working hard and learning and developing. Hope (and expect) he becomes as great a player as Brady became. Sat, Dec 10, 2011 : 4 a.m.
makes me respect Denard even more! Go Blue! Sat, Dec 10, 2011 : 5:33 p.m. I will second that and add, Denard's a real gutsy guy. Sat, Dec 10, 2011 : 3:08 a.m.
Shame on those who criticized him in the first place regardless of the injury. Many of the attacks were uncalled for and personal. Rich Rod was right, some people need to get lives. Sat, Dec 10, 2011 : 11:44 p.m. I hope your Rich Rod does to - and soon !